The temperatures are soaring, its just too hot to have heavy meals. I just want to make a quick salad and be out of the kitchen in a jiffy. For today’s salad, I mixed avocado, mango with beans. You would think that avocado and mango would be a weird combination but when I made this salad it actually tasted really great. If you are a lover of both avocado and mango then this salad is just right for you. I did not add any form of sweetness as the mango was sweet. 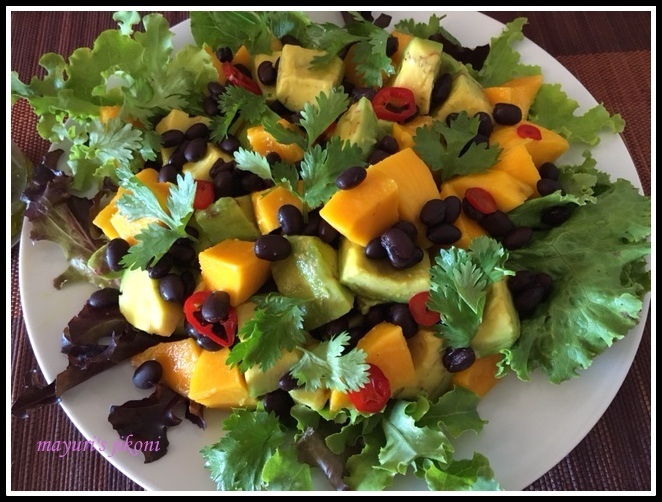 This salad has to be prepared just before serving as both the avocado and mango tend to turn black if kept cut for a while. Adding fruits, seeds, nuts and herbs makes any salad appealing, tasteful and nutritious. Go on try this recipe out, its refreshing and appetizing. Adding beans make it a salad full of protein for vegetarians. Mix 1 tsp lemon juice with the avocado chunks. Mix all the ingredients for the salad in a big bowl. Pour it over the salad, toss and serve. Don’t use over ripe mango or avocado as it make the salad mushy. Try fresh mint instead of coriander. If you prefer can add a bit of green chilli to it. Can use any salad leaves of your choice. Put the dressing ingredients in a jar and give it a good shake.